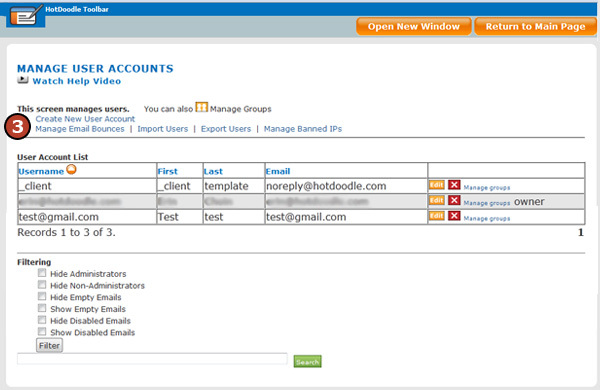 Users are the electronic identities associated with people who log in and use your HotDoodle website. You can create user accounts or configure your HotDoodle website to create individual user accounts by adding the Login Block. You might want to create users that will log in to your website and help you edit it. 2. Click on the "User & Group Accounts" button. 3. Click on the “Create New User Account” link. 4. Type in the First and Last Name of the user. 5. Type in the Email Address of the user. 8. Use the drop-down menu options to determine whether or not other users see the user’s email address and the format for the user’s emails. 9. Click on the "Advanced Fields" button. 10. 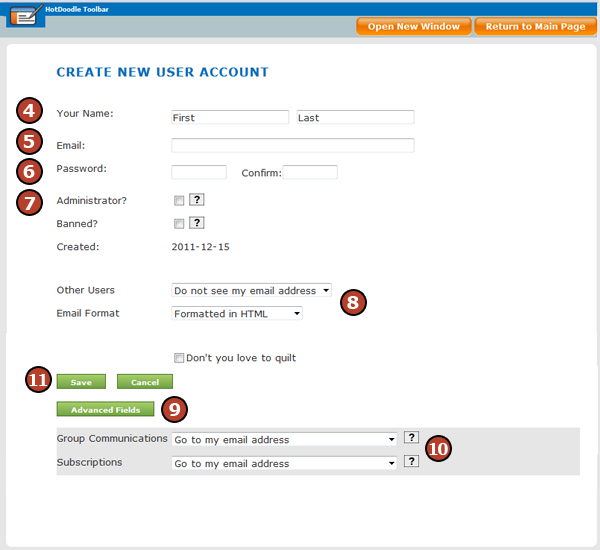 Select options from the drop-down menu to direct email from Group Communications and Subscriptions. 11. Click on the "Save" button. Users may ask to "subscribe" to part of the website which means that they are informed when that part of the website changes. This notification is in the form of a message that is sent to their email address or to an on website "inbox" that holds the messages, or to both. It is possible for users to subscribe to many website areas. An efficient option to create a group, a collection of users. Once a group is created, the group admin can subscribe group members to appropriate areas of the website. HotDoodle allows multiple discussions on a Bulletin Board of a website. Community-oriented websites might have a Bulletin Board with multiple areas, each dedicated to a specific topic. The website administrator or group admin can control notifications sent from the Bulletin Board and individual users can choose if they would like to receive the notifications. Note: To manage messaging or recipients, click on the "Manage User Accounts" or "Manage Group Accounts" links, which are found under the "Administration" tab -> "User & Group Accounts" buttons on the HotDoodle Toolbar. Other users - Options set if the user's email address will be shown to other users allowed to message the user. If you show your email address, you make it easier for people to contact you outside of HotDoodle, but you also make it easier for the address to get picked up and used by spammers. Email Format - Options set if email will be formatted in HTML or formatted plain text. HotDoodle allows formatted text almost everywhere. Formatted messages may look odd or lose content if converted to plain text. HotDoodle will convert to plain text if specified. Subscriptions - This gives the options to decide if you get subscription change notices (email notifications) and if these go to your email address or to the site inbox. Get Discarded - user will not receive any emails. Go to my email address - emails will be sent to the user's registered email address. Go to my email address and my site inbox - emails will be sent to the inbox set up on the HotDoodle website and to the user's registered email address. There may be users on the website that often have emails returned or bounce back as undeliverable email. 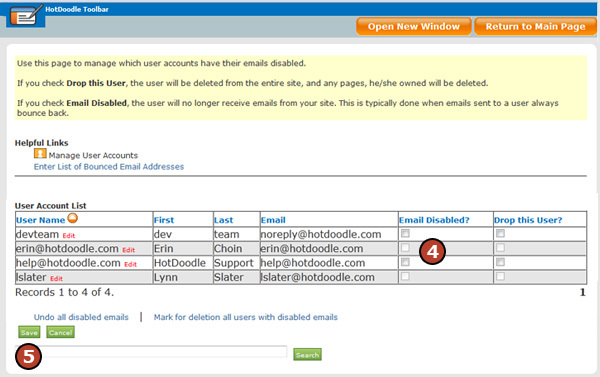 Configure the HotDoodle website not to send emails to those users to avoid receiving emails bouncing back undelivered. 3. Click on the “Manage Email Bounces” link. 4. Click on the checkbox next to all of the users to stop sending email to under the [Email Disabled?] section. You can also undo any disabled emails from this screen as well if a user updates their email address or fixes the problem that caused the emails to bounce back previously. 5. Click on the "Save" button. 3. Click on the "Edit" button to the right of the user you want to edit. 4. Edit the First and Last Name of the user. 8. Edit the drop-down menu options to determine whether or not other users see the user’s email address and the format for the user’s emails. 9. Click on the "Save" button.